- Make cake: Preheat oven to 350 degrees. Butter and flour a 9-inch round cake pan (2 inches deep). In a medium bowl, whisk together flour, baking powder, and salt. In a large bowl, using an electric mixer, beat eggs and sugar on high until pale and fluffy, 5 minutes. In a small saucepan, bring milk and butter to a simmer over medium. With mixer on medium, gradually add flour mixture to egg mixture and beat just until combined. With mixer on low, add milk mixture in a steady stream and beat until combined. Fold in vanilla and rose syrup or rose water. Add red food coloring if you would like to make the cake pink. - Pour batter into pan. Bake until top is light golden and a toothpick inserted in center of cake comes out clean, 35 to 40 minutes. Let cool in pan on a wire rack, 10 minutes. Run a knife around edge of pan; turn cake out onto rack to cool completely (top side up), 30 minutes. 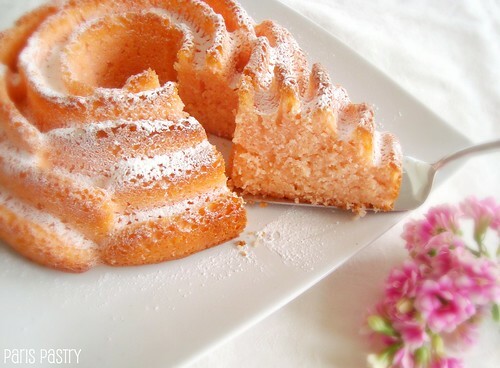 This is a beautiful cake, and it's a lovely pink color. Oooo pretty! 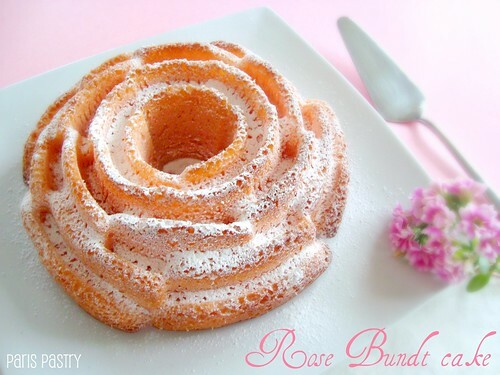 What girl could resist a pink rose shaped bunt pan! The cake looks really lovely. You repeat that mantra as often as you need to when it comes to something like this lol. So pretty and delicate. This looks delicious and lovely. Girly indeed, perfect for Valentines Day. Thank you.